By signing up for Maria Hoagland's email newsletter. ​Visiting Maui for a holiday wedding that never happens, Grae Beckett and Tate McKenzie find the unexpected--each other. Somewhere along the way, she stops being his job, and she starts needing him. 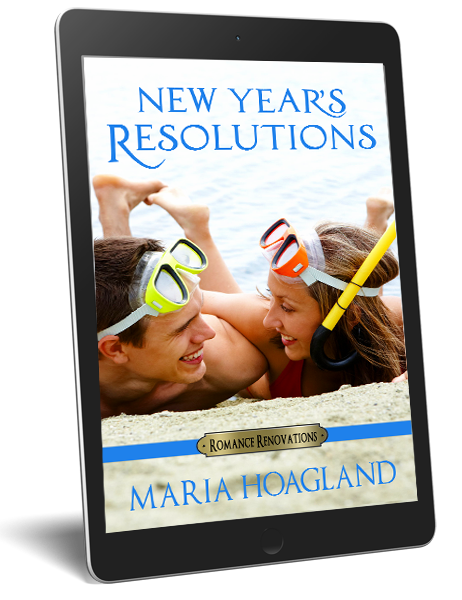 Part of the Romance Renovations series, "New Year's Resolutions" is a short holiday romance that can be read as a stand-alone. It's sure to delight readers who love Hallmark movies and sweet romance. Other holiday reads in this series include Home for the Holidays for Christmas, and Kayaks & Kisses for Thanksgiving.